Florence came to Cobra9 to reduce pressure through the pads of her feet with cycling. After a short period on the bike, her feet would go numb and stay numb until the shoes came off. To combat this, Florence was wearing shoes 3 sizes too big. After chatting to Pete Spencer, she was advised to consult with us to improve her shoe fit before working on the rest of her bike set up. 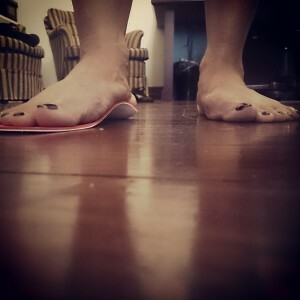 Mobile Flat Feet. Super wide! Florence has typically mobile feet with elements of excess laxity and extreme forefoot width. She also has bilateral bunion deformities occupying further space inside her shoes. Under load, Florence’s feet spread, flatten and drift inward. This is evident in the image above. The extremes of width and laxity in the forefoot have combined to contribute towards the numbness and discomfort. I have included the term ‘flat feet’ in the title as it relates to her weight bearing foot shape and is easy a title description. The pure fact that Florence has flat feet otherwise is immaterial. The movement is far more relevant. The key to fitting out Florence’s shoes with the Cobra9 Pro was to provide a level of control which reduced ‘deformation’ whilst occupying as little space as possible. Initially, the thought of using a metatarsal dome was proffered but the impact on space outweighed the benefit of forefoot profile alteration. Instead a 1 mm firm EVA base layer was combined with a 1.5 mm cushioned top cover to provide cushioning and space. Lots of space. The reduction in foot ‘deformation’ also aided in the reduction of relevant forefoot spread. The inner core carbon shell was specifically shaped to allow an element of distal metatarsal elevation providing some forefoot alignment shift and consequent pressure redistribution. 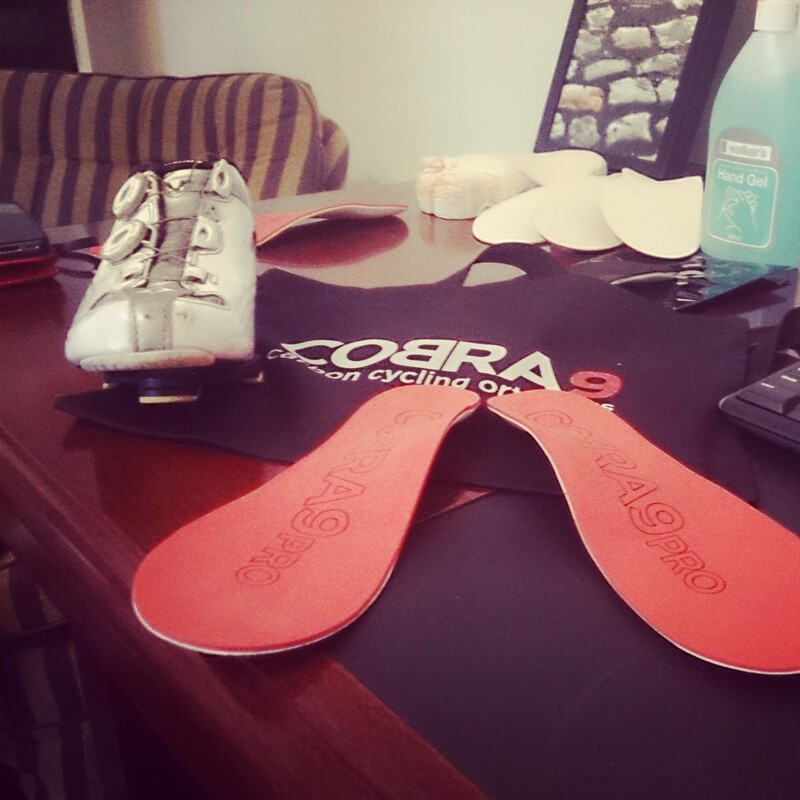 The result of this Cobra9 Pro device is a comfortable shoe, plenty of space and improved function. Due to the above mentioned features, it should be possible to get Florence back into an appropriately sized shoe without the issue of numbness impeding her bike riding experience. Currently we have Florence back into a 38 (from a 40!!) and will hopefully get her back down to a 37 with three independent closures. This is an unusual example where a degree of foot shape change has occurred. In many instances, the effect of cycling insoles is not as prolific and our ability to change posture is very small. Thanks to Florence for allowing us to share her information and feet! I have placed the term ‘deformation’ in inverted commas because although I find this word useful in describing foot function, it really is a clumsy term within the realms of biomechanics and science. However, discussion of ground reaction forces, moments of inertia and lever arms might cause some fatigue amongst blog readers. If you have any questions about the above case study or foot biomechanics queries, feel free to contact us here. Have a good weekend, ride hard and stay safe.